Unsafe storage devices and procedures may cause serious injuries in many different types of workplaces, including construction sites and manufacturing plants. 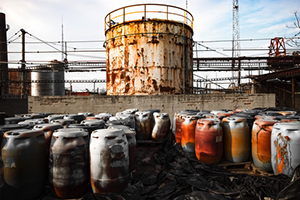 Improper storage may result in exposure to toxic gases or heavy equipment falling on a worker. The injuries may be catastrophic, and in many cases, your only remedy may be through your employer's workers' compensation insurance. At Pulgini & Norton, our Boston workers’ compensation attorneys understand the benefits system and can help assert your rights. Most incidents involving unsafe storage devices and procedures are not fatal. However, some toxic exposures and falls may cause catastrophic injuries or even death. For example, people with asthma are more likely to experience severe symptoms, such as nausea, dizziness, or a prolonged headache, when they are exposed to a toxic chemical that has been improperly stored. Employers are supposed to identify potentially harmful situations in the workplace and make sure that procedures are in place to make the workplace safe for employees. This includes preparing procedures for handling and storing toxic chemicals or other materials that could cause injuries, as well as training employees in these procedures. Even if your employer is 100% liable for your injuries, due to its failure to train employees in proper storage of a toxic substance or heavy equipment, your remedy is typically to file a workers' compensation claim. Workers' compensation does not require you to establish fault. In fact, even if you were the employee to blame for the unsafe storage of something that caused your injuries or illness, you may recover benefits. This is in contrast to personal injury cases, in which you need to establish a defendant's fault, and the defendant in turn may claim that you were partly or fully to blame to reduce or eliminate your recovery of compensation. The workers' compensation system is a no-fault system that is designed to make it easier to recover benefits. Nonetheless, in practice, it may be challenging to establish your claim and obtain benefits from your employer's insurer. In many cases, insurers are more concerned with protecting profits than making good on their promises of benefits. They may be suspicious about claims arising from failures to follow safe storing procedures, especially if a claim involves a cumulative injury sustained over a long period of time. They will likely require you to go to a doctor whom they have selected for an "independent medical exam." These exams are usually conducted by doctors whom they know are more conservative about diagnosis and treatment, and who frequently deny that claimants are ill or injured. They may also conduct surveillance of you in real life or on social media to determine whether you are exaggerating or lying about your illness or injury. It is important to be aware of this possibility. Even if you have privacy settings on social media, social media companies like Facebook do alter their policies with regard to privacy, and what you post about your accident or your injuries might undermine your claim. Valid workers' compensation claims are often denied. If you were made sick or injured at your job due to unsafe storage devices and procedures, you should retain an experienced Boston workers' compensation lawyer. Pulgini & Norton handles challenging workers' compensation claims throughout Massachusetts, including in Andover, Somerville, and Quincy. Contact us online or call us at 781-843-2200 for a free consultation with a workplace accident attorney.